Judging from this video’s almost 30 million views, it appears everyone would agree that it is a very effective fashion training video. Going by the popularity and effectiveness of this video, the Exaltive team decided to enhance it using Exaltive. I would be delighted to say that this video served as a great example of how an effective video can be made even better when it is made interactive. The Exaltive interactive version of the video would get you the effective training benefit in about 1.5 minutes, i.e. about 3x faster than the original video. Let’s look at how this happened. The original video packs lots of details into a very short period. But as a practical matter, it’s unlikely that one will actually learn how to make 25 styles in 4.5 minutes. It’s really more of a reference for the fact that there are so many styles. 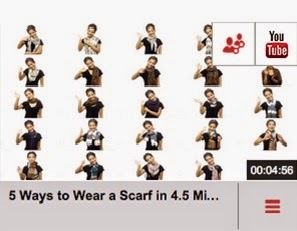 Most viewers will file this away for future reference for when they need a new scarf style. Of course, then they will have to hunt and peck with the slider to find what they want, and the visuals are so fast they will need to watch it several times to ensure you get it right, All of this is a lot of fiddling with the slider. An interactive version of the same 4.5 minutes video puts the view in control. The viewer can scan a menu of scarf styles, find the ones of interest and jump right to that section. If you like, you can watch it one or more times, if not, then you can click back to the menu without having to wait for the end, or mess with the slider. All in all, in 1.5 minutes you can quickly get the gist of all the styles, watch several in detail, and explore supplemental online information available online from Wendy Nguyen, the video’s creator. Perhaps the interactive version’s most effective feature is the ease of return visits. In an age of challenged attention, viewers want to quickly get to the gist, and they need to know that they can return for details when really needed. Navigation challenges make return visits in linear video difficult, but interactive navigation solves this problem very effectively. Of course fashion training is just one application, but this video clearly serves as an example of how workplace video with clickable features can be made faster and more effective. As you can see, the Exaltive interactions were applied to an existing YouTube video and a menu was created using loop back feature; similarly they can work well with most online videos. Click here to see how Exaltive works.